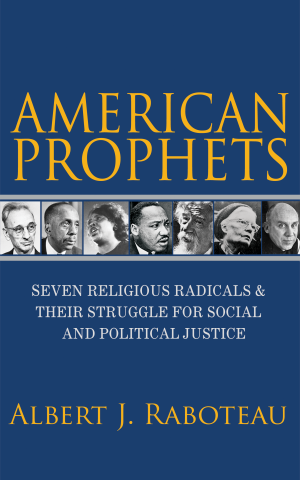 American Prophets: Seven Religious Radicals and Their Struggle for Social and Political Justice. By Albert J. Raboteau. Princeton University Press, 2017. 248 pages. $29.95 (Hardcover). Recently in the United States, activists have prompted new conversations about the nature of extremism in the nation’s social and political life. As protests rumble across ideological borders, Americans are searching for sources of authority that will bring coherence to experiences of crisis and difference. In this foment, urgent questions rise to the surface: How can a good society emerge across disparity and disagreement? When perspectives clash in fundamental terms, how can people resolve conflicts productively? Many of these questions—particularly over issues of race, gender, religion, sexuality, and economic status—cut to the very grounds of our individual and social existences. And, when activism demands that we reconsider history and politics, how do we define the character of radicalism itself? Religion plays a crucial role in the American contest of political extremes. As The Revealer wrote last month in its roundup of writing on “U.S. politics, race, racism, white supremacy and Christianity,” religious leaders from a range of traditions are advocates for interests on all sides. 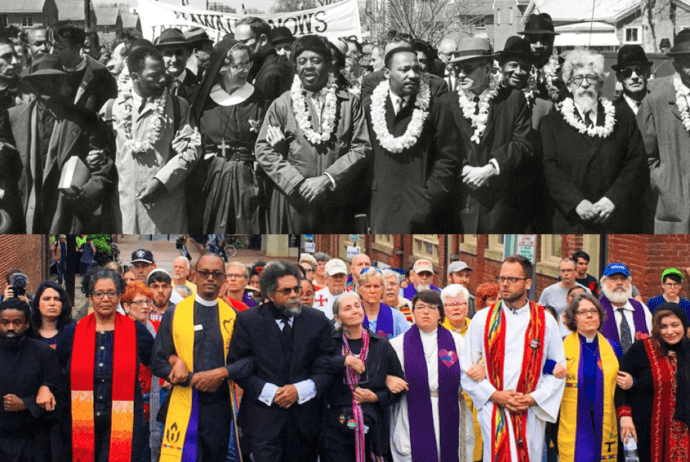 Notably in Virginia, the Charlottesville Clergy Collective assembled faith leaders as counter-protestors to the now infamous “Unite the Right” rally held there in mid-August. The Charlottesville group was initially organized in response to the June 2015, mass shooting and murder of nine African American Christians in Charleston, South Carolina’s Emanuel African Methodist Episcopal Church. 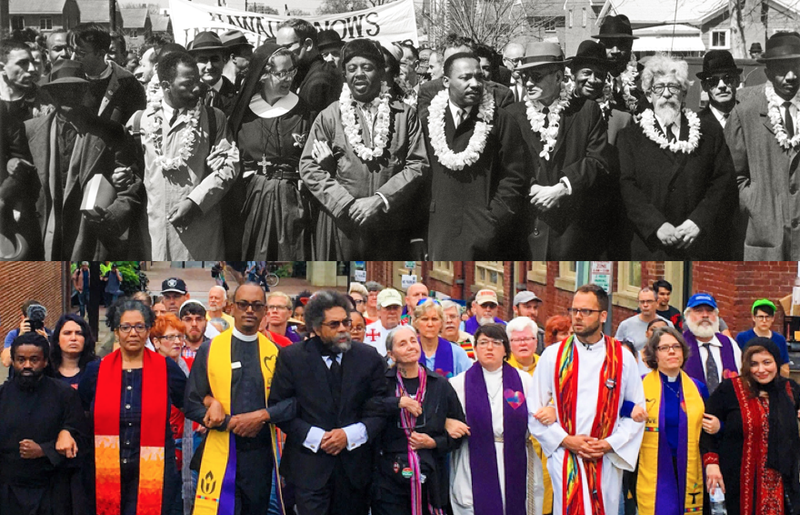 Their mission is to “establish, develop, and promote racial unity within the faith leadership of the Charlottesville-Albemarle Region.” In August, emulating the linked arms of religious leaders who marched in support of voting rights for African Americans during the 1965 protests in Selma, Alabama, these clergy members adopted the mantle of radicalism in witnessing against white supremacy. While Charlottesville’s clerics were organizing in 2015, the eminent historian of African American religions Albert J. Raboteau completed the manuscript for American Prophets: Seven Religious Radicals and Their Struggle for Social and Political Justice. In his newest book, Raboteau attends to the biographies of religious leaders who turned their faith towards activism during the twentieth century. The author, Princeton University’s Henry W. Putnam Professor of Religion, delivers a popular account voiced in an honorific rendering. His goal is more to formulate a clear moral vision than it is to create a single volume of critical history. Overall, American Prophets is the work of a prominent thinker and historian putting his skills and wisdom to use in order to advance a social disposition, delivering an activist missive into the radical religious tumult of twenty-first-century U.S. America. In American Prophets, Raboteau intervenes at an important crossroads for theorizing the relationship between political radicalism and religion. Scholars and activists alike have clashed over questions about the compatibility of the terms. Is religion essentially antithetical to radical politics? Is political activism an appropriate venue for expressing religious sentiment? Often assigned as a species of left-wing ideology or “Godless communism,” radicalism carries associations with antireligious animus. Conversely, religion has been understood as inimical to fair political process. As concepts and forms of practice, however, religion and radicalism stand adjacent. Both terms are concerned with the fundamental ground of reality, pointing towards basic causes. Deriving from the Latin radix, meaning “root,” radicalism has to do with getting at the fundamental essence of problems. In Karl Marx’s much-quoted phrase, “[t]o be radical is to grasp things by the root.” Similarly, religious systems and ideas often function to lend coherence and meaning to experience, explaining origins and orienting humans to the cosmos. Even more, as iterated through politics, Marx tied the emergence of radical revolutionary impulses to Christian roots, in the reforms advocated by Martin Luther’s propulsion of Protestantism out of early modern German society. In this telling, religious activism birthed political radicalism through its drive towards the individual as an object of principal concern in structuring society. Although he avoids reference to Marx, Raboteau unfolds a similar construction of the radical and the religious. He does this by developing prophethood as a device for bridging the two concepts, characterizing the advocacy of social and political interests as an expression of spiritually defined justice. In Raboteau’s rendering, “prophets” are those who focus their energies on “conveying…compassion [for those suffering injustice or oppression] to the larger American public through writing, speaking, demonstrating, and/or organizing.” In this, American Prophets signals no essential deviation from communism’s infamous theorist: Marx’s “radical” was justice-seeking too, aiming “to overthrow all those conditions in which [the person] is an abased, enslaved, abandoned, contemptible being.” On this point, however, Marx opened a line of division between religion and radicalism wherein religion imposes a false awareness of reality that obscures the true nature of things. American Prophets accumulates its own special stories that together fulfill Raboteau’s typology of modern prophethood. Dedicating a chapter to each, the book narrates the biographies and intellectual contributions of seven figures, elevating them as exemplars of spiritually engaged social and political radicalism. The figures include: Abraham Joshua Heschel, Hasidic rabbi and mystic; A. J. Muste, pacifist Quaker leader of the Fellowship of Reconciliation; Dorothy Day, co-founder of the Catholic Wormer movement; Howard Thurman, Baptist minister, Christian intellectual, and co-founder of the Church for the Fellowship of All Peoples; Thomas Merton, Trappist monk and theorist of nonviolent activist spirituality; Martin Luther King, Jr., Christian minister, political theorist, and principal leader of the 1950s and 1960s civil rights movement; and Fannie Lou Hamer, local voting-rights activist in Mississippi and leader of efforts to reform the national Democratic Party. As a record of the events, experiences, and ideas that these figures encountered, American Prophets defines ideal parameters for orienting thought and activism towards justice. The book focuses on its subjects’ conceptions of theology, ethics, rhetoric, and strategy in order to “illuminate how these exemplars of twentieth-century prophecy in the United States persuasively mobilized some of their fellow citizens to commit themselves to movements for social change.” Through these descriptions, Raboteau advances a shift in scholarly interpretations of religious radicalism that is produced by and further supports the moral stance he advocates. To elaborate this thesis, Raboteau sequences chapters in three phases. In the first, Heschel, Muste, and Day comprise a palette of characteristics from which Raboteau illustrates the features of radical religious activism. In the second, Thurman frames the core direction of his argument, fusing together race and spiritual experience as the fundamental locus of religious radicalism. And finally, Merton, King, and Hamer exemplify the book’s thesis, displaying the theoretical development and activist deployment of antiracism as an outgrowth of experiential religion. With Heschel, Muste, and Day, American Prophets identifies the theme of religious experience as a source of human unity. Prophets make effective radicals because they fuse spiritual experience with political conviction in order to promote common well-being. In this, religion’s capacity for moral vision brings it into alignment with activist mentality. For Muste, materialism, racism, and militarism served as three “great evils” that demanded opposition. These correspond to three central Catholic Worker principles of voluntary poverty, personalism, and pacifism that structured Day’s efforts. These attitudes and concerns furnish the baseline for Raboteau’s prophet-type. Experience carries forward as a central feature in Raboteau’s theoretical exposition of prophethood-as-radicalism through his narration of Howard Thurman. As was the case with Muste, Thurman drew insight from the Quaker mystic Rufus Jones, who “insisted that religious experience ought to result in social action to transform the world into the kingdom of God.” Theorizing more than participating in social action, Thurman instead “chose to exercise leadership behind the scenes by force of his personal presence and pastoral counsel.” He focused on cultivating influence, using his writing and speeches to share his spiritual and political message. Faces must be shown and must be seen before interracial community is possible. This confrontation—in the sense of face to face—without the masks of evasion, fear, discomfort, and false civility, must occur between white and black, painful and difficult though it may be, if we are to continue the search for common ground—the search that is the very manifestation of the life within. From this, Raboteau turns to Merton, King, and Hamer in order to narrate the prophetic typology more fully. In this trio, Raboteau finds ideal examples of his category, “which models a kind of communication across differences of racial, vocational, and biographical backgrounds.” The characteristic values of Heschel, Muste, and Day fused with the experiential worldview of Thurman to find expression in these latter exemplars, for whom “the interrelatedness of human beings—the hidden wholeness that binds us all together—is key to understanding and accepting our responsibility for social justice.” The assembled witnesses of Raboteau’s seven radicals thus outline the contours of an orientation to society and politics that Raboteau finds to be of continuing urgency in the United States. As a study of religion’s radical valences, Professor Raboteau’s new work partakes in a peculiar feature of writing on political radicalism. In such works, with attention given to ideological extremes, the author’s own ideological perspective resides at the foreground of his analysis, rather than being pushed into an imagined rhetorical objectivity. Raboteau sets this characteristic to interpretive purpose and constructs a laudatory account of the seven chosen figures. This falls in line with much of Raboteau’s other writing. As a scholar, he is a preeminent interpreter of the African American religious past, but is also a significant theorist of the role played by religious faith in the life and work of historians. American Prophets merges his voice as a Christian contemplative with critical historiography to portray narratives that advocate for a vision of the common good. And that vision is part of the entrenched problems stemming from America’s racist social foundations. The complex, essential interaction between religion and radicalism emerges for Raboteau in the various iterations of racism and antiracism that unfolded through the U.S. past, and which resonate forcefully into the present. Where Heschel understood the problem of race in the United States as “God’s gift to America, a spiritual opportunity to rise above complacent prosperity,” Raboteau envisions a key for unlocking both interpretations of and activist interventions into a fundamental social problem. This is where Raboteau’s double voicing carries special importance. Through this dynamic relationship, faith and history pose essential questions to one another. In Raboteau’s conception, faith asks history to address questions of significance and application: “How can you find a vantage point within history from which you can judge the significance of human events?” Without applicable purpose, historical interpretations lack meaning. History, in turn, demands of faith an acknowledgment of the contingency that is forced by context, an awareness of “the historicity of their religious doctrines and institutions.” The two “coalesce [for Raboteau] in their mutual admission of the necessity of plot.” As interpretive frameworks, faith and history both rely on narrative. Thus, the stakes of historical writing are higher than just the standard historicist drive to understand the past for its own sake. Understandings of the past can exert powerful force on how life is lived in the present, on how one orients oneself towards progress and social change. One of the primary thrusts of Raboteau’s career has been to correct interpretations of U.S. history that “denied black people any past of significance.” Before historiographical shifts that Raboteau helped to initiate in the 1970s, religious histories of African Americans were flattened into narratives that “dismissed [African Americans] … as mere imitators of white culture.” Acknowledging the personal agency, cultural creativity, and resilience of African Americans opened historical interpretations to a full range of wildly diverse expressions of religion. In turn, these acknowledgements transform notions of individual and collective identity for those within and outside African American communities. This application of scholarly advocacy forms the crux of Raboteau’s analysis. As the book nears its conclusion, the author continually underscores the assertion that, if we follow the examples of his chosen prophets, we can also overcome racism and injustice. In essence, American Prophets reduces radicalism to a form of engaged religious experience. The radicalism that it champions rests on and valorizes the mentality of Abraham Joshua Heschel, who believed that “our actions hasten or delay the healing of the world. This is why marching in Selma was simultaneously a political act and an act of devotion helping to release the divine sparks into a world darkened by the evil of racism.” For Raboteau, the root that radicalism grasps is fundamentally religious. Karl Marx, “Contribution to the Critique of Hegel’s Philosophy of Right: Introduction,” in The Marx-Engels Reader, ed. Robert C. Tucker, 2nd ed. (Norton, 1978), p. 60. Geoffrey Pollick, Assistant Professor of Religion at Sweet Briar College, teaches and researches the history of religion in the United States. His work emphasizes religion’s entanglements with political radicalism, the role and dimensions of religious liberalism, critical theory of religion, and the cultural history and historiography of religion.